Chikyû Kogeki Meirei: Gojira tai Gaigan (1972) - Sci-fi-central.com.  Japan  1972  89m   Directed by: Jun Fukuda.  Starring: Hiroshi Ishikawa, Yuriko Hishimi, Minoru Takashima, Tomoko Umeda, Toshiaki Nishizawa, Zan Fujita, Kunio Murai, Gen Shimizu, Zekô Nakamura, Kuniko Ashihara, Akio Murata, Noritake Saito, Yasuhiko Saijô..
Aliens from space plan to conquer the world using space monsters Gigan and King Ghidrah, which they control from their secret headquarters inside the head of the Godzilla-replica building at a theme park. The only thing that can stop them is the combined efforts of Godzilla and Anguirus. I never thought the 70's Godzilla films were quite as bad as they are usually made out to be, although for the most part they definitely lack the charm of the 60's films. "Godzilla vs. The Smog Monster" from 1971 was actually a decent movie, despite that atrocious (or fun depending on your view) American title ("Godzilla vs. Hedorah" just didn't have the same pep I guess). 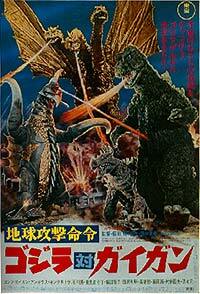 "Godzilla vs. Gigan followed "Smog Monster" and it's good for what it is, but not nearly as much fun. When "Godzilla vs. Gigan" finally came to American shores, in 1977 or 1978 I believe, I was a longtime Godzilla fanatic, with G and his pals on my school notebooks and locker, and I would always have debates on who won in "King Kong vs. Godzilla" as well as other Godzilla-inspired arguments. I was especially psyched because this movie (under the title "Godzilla On Monster Island") was the first, and only, Godzilla film of the "original series" I actually saw in the theater. The 70's were great for movies because a lot of "little" movies were around to be seen, and they even got their own cool little ads in the newspaper too, saying what three theaters the film was playing in. So when I saw that "Godzilla On Monster Island" was gonna be at a local theater, I was ready! I remember asking this one girl I really liked to go with me, but she refused lol...so hey I went anyway of course, Godzilla was the reason for me being there, not some girl. It was a discount theater, only $1.00 to get in. I remember being outside waiting for the doors to open, and seeing this teenage couple waiting too, the guy had a real depressed look on his face, kind of like a "2 bucks is all I can afford so all I can take her to see is this dumb Godzilla movie" look. The girl, well she really didn't look too happy to be there. I hope he made out ok and she gave him a break. The film itself isn't a great Godzilla film, lots of stock footage, some bad (and some good) FX, a fair plot. Actually, the Japanese soundtrack CD to this movie is great, one of the best of all the Godzilla films. (Do I sound like a Godzilla geek yet? Of course I do.) I got turned off with the whole "talking" thing G and Angilas did...wow that was bad. But there are a lot of the things that make Godzilla films so charming, like the very obvious fake flying model that's supposed to be King Ghidorah. You gotta love it when they just swing that thing around without making any attempt whatsoever to make it look realistic at all. That's one reason why these films are so great...hey, need an airplane in that scene? Ok, connect some wires to it and zip it past the camera. Great stuff! I wanted to see the film in the theater again before it left (2 days later I think) but I couldn't afford it...but hey, at least I got to see one of the old G flicks on the big screen. So in that respect, "Godzilla vs. Gigan" will always be a little special to me, even though as a Godzilla film, it really isn't that special at all and is probably the blandest of the 70's G films. Review by stevenfallonnyc@yahoo.com from the Internet Movie Database. Godzilla vs. Gigan (1972) Review.